Key difference: Data and information are interrelated. Data usually refers to raw data or unprocessed data. It is the basic form of data, data that hasn’t been analyzed or processed in any manner. Once the data is analyzed, it is considered as information. Information is "knowledge communicated or received concerning a particular fact or circumstance." Information is a sequence of symbols that can be interpreted as a message. It provides knowledge or insight about a certain matter. Data usually refers to raw data or unprocessed data. It is the basic form of data, data that hasn’t been analyzed or processed in any manner. Once the data is analyzed, it is considered as information. Information is "knowledge communicated or received concerning a particular fact or circumstance." Information is a sequence of symbols that can be interpreted as a message. It provides knowledge or insight about a certain matter. Information can be recorded as signs, or transmitted as signals. Basically, information is the message that is being conveyed, whereas data are plain facts. Once the data is processed, organized, structured or presented in a given context, it can become useful. Then data will become information, knowledge. 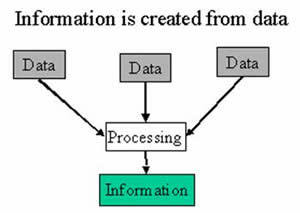 Data is used as input for the computer system. Information is the output of data. Data is unprocessed facts figures. Information is processed data. Data doesn’t depend on Information. Information depends on data. Data is not specific. Information is specific. Data is a single unit. A group of data which carries news and meaning is called Information. Data doesn’t carry meaning. The information must carry a logical meaning. Data is the raw material. Information is the product. Numbers, letters, or a set of characters. A structure, such as tabular data, a data tree, a data graph, etc. thanks alot just finish doing my biostatistics assignment now and it was really helpful. Thank u so much to help me.It is really simple and understandable..